Like any other type of alcohol, beer can cause a hangover. Even two pints on an empty stomach can feel the next day like one has drunk the whole night. 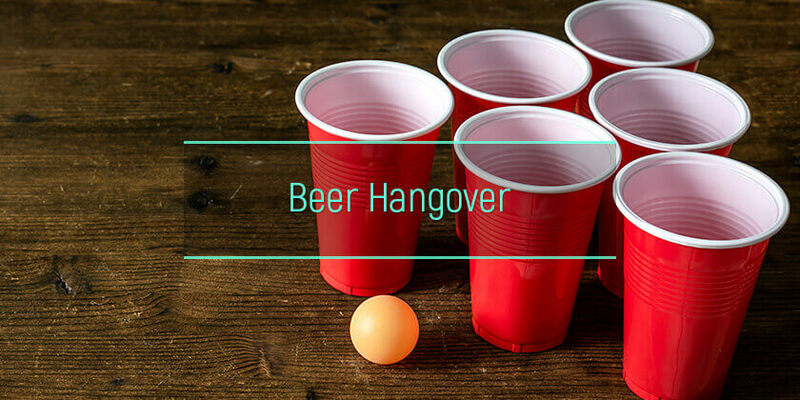 Once the alcohol in the bloodstream starts to drop, the beer hangover symptoms will begin affecting the entire body. What are the causes of beer hangover? What are the symptoms of beer hangover? What is the link between light vs dark beer and hangover severity? Do different types of beers give different hangovers? How much beer will cause a hangover? Does beer help with a hangover? Those who say that beer does not have enough ethanol to cause a headache are wrong. Beer hangover is as real as any other hangover caused by vodka, wine, brandy, whiskey or tequila. So, an upset stomach after drinking beer and a terrible headache can happen to anyone and here is why. The majority of ale brands on the market have alcohol by volume or ABV of between 4% and 6%. Ethanol, or the alcohol in the drink, is responsible for the morning headache. Why does beer make one pee so much? Ethanol is a toxic chemical which functions as a diuretic. Peeing more means getting dehydrated faster and dehydration is also responsible for the beer withdrawal symptoms. A hangover is a form of alcohol withdrawal at an early stage. But alcohol isn’t the only one to blame here. Congeners are the non-ethanol products resulted from the fermentation process, and they also play a role in getting a headache. The number of congeners is higher in ale compared to liquor. These are only two of the theories why ale hangover is as real as red wine hangovers. The body converts the ethanol in ale into acetaldehyde, which is a toxin which impedes brain activity. This leads to the lowered inhibitions and decreased judgment specific of the intoxicated, but also to the excruciating headache in the morning. Because brew is diuretic, the body dehydrates faster, leading to hangover symptoms such as dry mouth and a pounding headache. Alcohol also irritates the stomach, which leads to nausea and the correlation between beer and upset stomach. Another important cause of beer headache is the buildup of acetaldehyde in the blood, a chemical resulting from processing ethanol. This chemical is much stronger than alcohol and is the one which causes vomiting, nausea, excess sweating and diarrhea after drinking beer. These hangover symptoms are similar to the ones experienced by an alcohol addict. The good part is that they last only a maximum of 24 hours. Both types of beer have their unique taste and nutritional benefits, but the color of the beer has nothing to do with the ethanol content. Color is only given by the length of the brewing process, the malt used and other ingredients. Some dark ales, such as Guinness stout, have a lower alcohol content than a light ale. 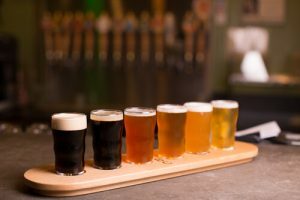 Black lagers, porters and stouts, all have around 4% alcohol by volume, so less ethanol, and calories than a light beer which would taste almost like water. The only difference is that dark ale has a much fuller flavor. Mixing light and dark ale does not affect at all the severity of hangovers. What matters is the quantity of beer drunk and not the form or order in which it is consumed. It is possible that different types of brews give different hangovers and this applies to other types of drinks too. For example, craft ale is made with the same ingredients as regular beer, but it usually has more ethanol, between 7% and 9%. If a person drinks three microbrews, it would be the equivalent of nine domestic light brews, when it comes to the alcohol content. This means that it will take craft brew less time to give someone a headache. Some persons would find IPAs give them a hangover and other types of beer don’t. The explanation for this would be that IPAs contain a higher hop content, affecting the brain’s chemistry in a positive or negative way. Some persons may be allergic to the compounds in hops, therefore giving them worse hangovers than other beer would do. These people can get a headache after one beer. Congeners, the substances resulted during the fermentation process, also affect hangovers. Congeners include acetaldehyde, acetone, tannins, and fusel oil. These chemicals cannot be processed by our bodies and make us feel sick and give worse headaches than mass-produced ales. Darker beverages, such as dark ale, craft beer, and cheaper drinks have an increased number of congeners. Although congeners can be filtered some craft beers contain them because they give a bolder color and a richer aroma and flavor. The number of ales one can drink without suffering a hangover the next morning depends on many factors such as health, physiological makeup, family’s drinking history, the person’s drinking history, level of hydration in the body, the type of beer consumed, the level of tiredness before drinking, etc. Smaller persons usually have less tolerance for alcohol. Also, beer on an empty stomach would increase the chances of a serious headache. The same would happen if someone drank many beers very close together. People who do not usually consume alcohol or who rarely drink have higher chances of getting a hangover from over-imbibing. That is why it is almost impossible to say how much brew is safe to drink to avoid a hangover. Does Beer Cure a Hangover? Some say that drinking ale in the morning after indulging too much the night before might help with the hangover. A beer might make someone feel better temporarily because the level of ethanol increases in the body. But this only prolongs the agony and does not rid the hangover. It’s like a champagne bad hangover. Drinking more champagne does not solve the problem. There are other factors which can help with the hangover but putting more alcohol in the body will just make the person crash again once the ale wears off. So, is beer good for an upset stomach? The answer is no. The best prevention is to drink less or to find out what to drink instead of beer if brew makes one sick. Alternating a glass of beer with a glass of water and eating while drinking will also work in preventing a morning headache. The beer withdrawal symptoms can be unbearable for some people. Who would not like to know an efficient beer hangover cure? Unfortunately, there is not any rapid solution to ale hangover, like there is no vodka hangover cure. There is also no quick whiskey hangover cure in case someone was wondering. There are some things to relieve discomfort, such as drinking water, eating light carbohydrates, Ibuprofen and a lot of sleep and rest.